by physicians and surgeons of the principal London hospitals. Corporate authors : London physicians. New York : Cassell, Petter, Galpin. Description : 5 v. ; xxxii, 1030 p. ; ill., port.s ; 25 cm. Photographs : five tipped-in frontis portraits of physicians. Subject : Medicine — Popular Works. Second edition – a first edition of 4 volumes appeared in 1865. 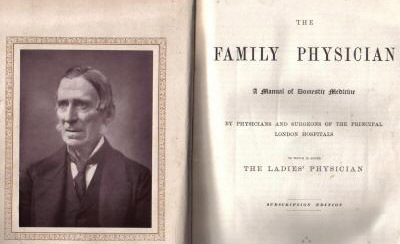 Each volume issued with a tipped-in portrait of an important London physician.